Do a favor by finding a rare item. Get a mammoth tusk for Ysolda. This is a radiant quest which you can receive from any of the following people. The books have a fixed location the quest marker points to, but returning any copy will do. You must find the other items on your own. Note: Only one radiant quest of this type can be assigned at any given time. You must clear the radiant quest from your miscellaneous quests in order to be eligible to receive another of the same type. † Siddgeir must be Jarl of Falkreath for him to give this quest. Receiving the Letter from Jarl Siddgeir of FalkreathHF at level 9 also makes it impossible to acquire this quest, even if you don't read it. All of the items can be found in multiple places in the game. For more thorough lists of locations, see the item's page. There is a guaranteed Amulet of Arkay at Wayward Pass at the Shrine of Arkay. You can also obtain one easily by starting The Taste of Death in Markarth. Note: Be careful when bringing the amulet back to Torbjorn Shatter-Shield. The quest marker may indicate that you should enter his house, the door of which may be unlocked, but if you enter you may be treated as a trespasser with no option to tell Torbjorn or his wife what your errand is. Meet him on the street during the day instead. 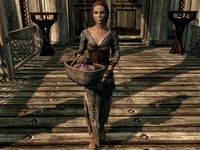 Black-Briar Mead can be found in large quantities or bought at the Black-Briar Meadery, and are guaranteed in other locations as well, most closely in Lod's House (on the table with the private letter required by Dengeir of Stuhn's quest Some Light Theft). They may also be bought from most innkeeper merchants. There is also one at the end of the cave in Unbound, right where you are told to sneak past the bear. If you'd prefer not to steal one and are unable or unwilling to kill a mammoth, Halted Stream Camp just north of Whiterun contains several mammoth tusks. Belethor, the general goods merchant, has a chance of stocking one if you're willing to pay for it. With Hearthfire, a free one can be found in the Main Hall of your home, if you build one. With Dragonborn, one can be found in Severin Manor, and is free to take after you take ownership. After accepting this quest, a copy of The Mirror can be found in Windhelm's Palace of Kings. This is where your quest marker will point you, but it will count as stealing unless you are Thane of Eastmarch. Captain Aldis will accept a stolen copy. Copies may also be found on the bookshelf in the sleeping area of Broken Tower Redoubt in the Reach, or in Forsaken Cave in the Pale, over a table in the first tomb's zone. A copy of Night Falls on Sentinel will spawn on a crate in Swindler's Den after accepting the quest. Copies may also be found in a bandit camp near The Guardian Stones, and in Volunruud during the quest Silenced Tongues. Unfortunately, Song of the Alchemists cannot be obtained without stealing in the base game. After activating this quest, a copy spawns in the Bards College on the main floor, to the right from the entrance on the counter (a blue book). It is not marked as stolen, but you will still incur the penalties of stealing if you are caught taking it. The book can also be stolen from Anise's Cabin near Riverwood. If you have the Dragonborn expansion, a copy which does not require stealing can be found in Apocrypha, inside the Black Book called Waking Dreams, in Chapter III. Halted Stream Camp is the location of a bounty quest, possible location of a Dungeon Delving quest from Amren, and possible location of the Amulet of the Moon quest, making it easy to complete multiple quests at once if you choose to find your mammoth tusk there. It is also one of only two locations where the Transmute spell tome may be found. If Hearthfire is installed, then the Jarl of Falkreath will send you a message via courier once you have become level 9, as long as you have not yet started the Falkreath thane quest. If Rare Gifts is in your journal when the courier is given the message, you will fail the quest and it will be removed from your journal. Reading the note the courier gives you will start the quest Build Your Own Home. Because this is a favor quest which affects the quest giver's disposition, it will count towards the "Help the People" part of the thane quest for the quest giver's hold, except if the quest giver is a jarl. You must have the item in your inventory for the quest giver's quest pointer and dialogue to display. If you complete the Stormcloaks quest Battle for Solitude, Captain Aldis will no longer be part of the city and the indication arrow for you to follow will lead to a blank floor, where Aldis previously stood. Captain Aldis can be spawned again using the console command player.placeatme 00041FB8. Afterwards, you can speak with him about quests like normal. An alternative is to type SetObjectiveCompleted Favor110 10 1 in the console to complete the quest and then to remove The Mirror from your inventory by typing player.additem 0001AFDE -1. It seems likely that Siddgeir was intended to give a leveled piece of armor as a reward, however he gives potions instead. It's also possible that this was a last-minute change. Mod Notes: The FavorRewardArmor property on TIF__00090DEE is set to FavorRewardPotion. On the PC, it is possible to use the console to advance through the quest by entering setstage Favor110 stage, where stage is the number of the stage you wish to complete. It is not possible to un-complete (i.e. go back) quest stages, but it is possible to clear all stages of the quest using resetquest Favor110. This page was last modified on 12 August 2018, at 04:44.